A Mutant Digimon that evolved from a Mamemon that fused with file management software data. It has a serious personality and an uncompromising side, and seems to think that managing Digitama is its duty. It is also capable of walking without needing to float, by using its arm parts as legs. 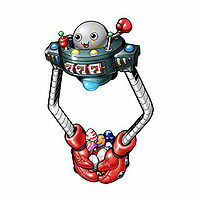 Its Special Move is catching any Digimon that try to lay their hands on the Digitama, and in order to ensure that they do not retaliate, uses a mysterious power to turn them into a plush toy and carries them away (Magic Arm). 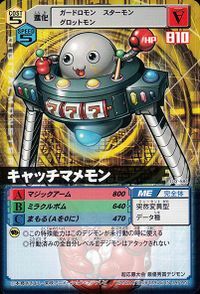 Not only that, its "Miracle Bomb", which activates when the slots that start spinning during capture lands on triple sevens, turns the captured Digimon into a bomb and uses it to attack. It is said that the power of the bomb corresponds to the power of the captured Digimon. A Mutant Digimon that evolved from a Mamemon that fused with file management software data. It has a serious personality and an uncompromising side, and seems to think that managing Digitama is its duty. | Catch from UFO catcher. | Mame (豆) means beans or peas. Magic Arm  マジックアーム Majikku Āmu Grabs an enemy and changes them into a plush toy. Miracle Bomb  ミラクルボム Mirakuru Bomu Turns a grabbed enemy into a bomb when its slots show 777. The bomb's power depends on the strength of the transformed Digimon. 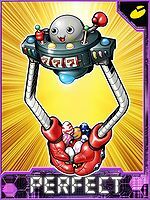 Catch Mamemon is only obtainable as a collectable card. Its card is part of the Mame Guys (マメなやつら Mamena Yatsura) set. Catch Mamemon is available as a Digimon Medal. 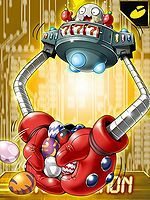 Catch Mamemon is available as a Digimon card. 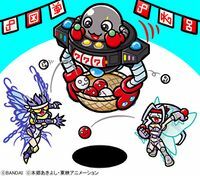 ↑ Catch Mamemon won first place in the Original Digimon Design Contest. This page was last modified on 14 April 2019, at 22:42.